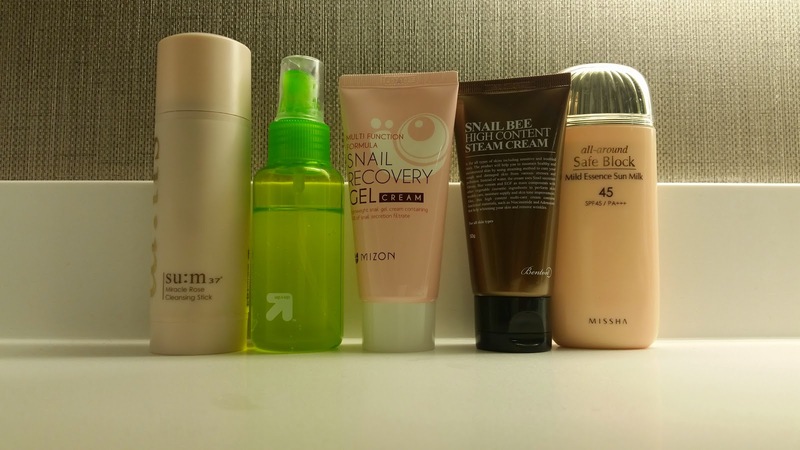 Travel Skincare, and the need to reevaluate my routine | Holy Snails! As some of you know, I went to Dallas last week for a little family vacation. (See photos of my kbeauty hunting excursion here.) I decided I would take just a bare minimum of products with me to see how I would fare. Yep, single cleanser. I like the su:m37 Miracle Rose Cleansing Stick, even though I do not think it lives up to its hype whatsoever, but so far I have liked it. Except when used by itself. Goodness, even with both the Recovery Gel and the Steam Cream, I was still flaky and dried out. This cleanser works fine as a second cleanser, but on its own...nope. I had already decanted my Etude House Collagen Moistfull Refresher into a spray bottle, because the bottle it comes in is flat out evil, so it made sense to just toss that into my bag instead of my beautiful glass su:m37 Refresher. This toner is so "meh" that I'm just trying to use it up. I'm kind of on the fence about this. On one side, it's $5, which means if it does anything at all, it's ok in my book. But at the same time, $5 for a crappy product is still $5 wasted. The Mizon Snail Recovery Gel Cream has a really thick consistency for a gel - it's like petroleum jelly even, and it smells rather alcoholy. It absorbs pretty well though, not just sitting on your skin - although obviously the alcohol has something to do with that. It did not work well as a standalone moisturizer for daytime. Benton Steam Cream - I have heard so much praise for this cream that I've rushed to use it. I'm actually kind of meh on it as well. It moisturizes ok, but honestly it's not really that cheap or that amazing. It didn't prevent the flakiness from my cleanser drying me out, even after layering on a toner and a light moisturizer beforehand. I would have gladly gone with just a cleanser and a sunscreen if I had to go absolute barebones for this trip. I had been using the Biore Sarasara UV Aqua Rich Watery Essence Sunscreen (omg that title! ), but had just gotten my new sunscreens in from MisshaUS. I had used Missha's Mild Essence Sun Milk previously, and just like it so much better. The Biore smelled like straight up vodka, so even though the Missha feels a little heavier and takes a bit longer to sink in, I think I prefer it. I definitely have to change it up next time we travel. This was not enough. I wouldn't want to bring more products, but definitely change the products that I did bring. Surprisingly, I didn't end up with a ton of clogged pores by the time we got back home, so it wasn't a disaster. What is your travel routine?